A 4-bedroom house with mooring perfect for families or friends. 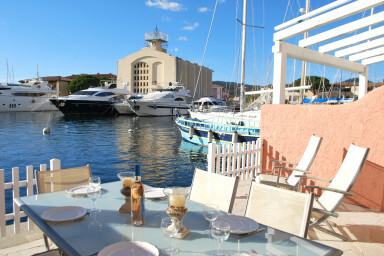 Pretty 8-epople fisherman house in quiet area close to the center of Port Grimaud 1. On the ground floor, a bright living-room with an open kitchen. On the 1st floor, 2 bedrooms with a double bed and a bathroom. On the 2nd, 1 bedroom with a double bed, 1 bedroom with bunk beds and a single bed and a shower-room. On the street side, a nice terrace with shadow. On the canal side, a very sunny West-oriented terrace with a superb view on the marina and the Church. A 14m x 4,20 mooring. The perfect house to enjoy the life and facilities while being in a resting area.